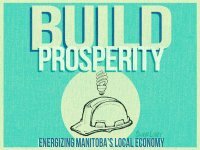 BUILD Prosperity outlines how Manitoba’s fossil fuel tab can be replaced with jobs and justice in the local economy. From Manitoba Hydro to government cafeterias – these bold, practical ideas make a compelling case for change in how our most familiar institutions are organized. There are many kinds of poverty but by far the most dangerous is the poverty of ideas. BUILD Prosperity outlines many ideas that generate wealth through employment in low income rural, northern and urban communities. Shaun Loney is the Executive Director of BUILD. He was Manitoba’s Director of Energy Policy from 2002 to 2008. He can be reached at shaunloney at mts.net.